Exit at Pacific Grove/Del Monte Ave.
Travel south on Highway 1 toward Monterey. Continue on Del Monte Ave, through stop lights at Case Verde, Sloat Ave., Camino Aguaqito and Camino El Estero. Turn right at the fifth stop light, onto Monterey Wharf #2. MPYC is on left, first building on the wharf itself (low brown wooden building). Drive straight ahead, onto the wharf and find parking (metered-get your quarters out!). If no parking is available on the wharf, try the public lot (left turn just prior to driving onto the actual wharf). Travel north on Highway 1 toward Monterey. Exit at Casa Verde Ave. Turn left at bottom of ramp (onto Casa Verde Ave) and go under the freeway overpass. Turn left at the first stop light, onto Del Monte Ave (going towards Monterey/Pacific Grove). Continue on Del Monte Ave through stop lights at Sloat Ave., Camino Aguaqito and Camino El Estero. Turn right at fourth stop light, onto Monterey Wharf #2. 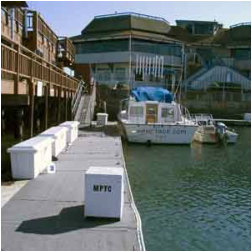 Drive straight ahead onto the wharf and find parking (metered-get your quarters out! ).